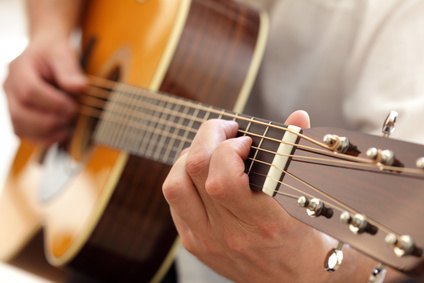 Learn how to tune your guitar so it sounds as good as it can! The first thing you need to know about tuning a guitar with a tuner is that you should use a chromatic tuner, not a guitar bass tuner. The chromatic tuner will recognize all the notes the instrument is capable of producing (or any instrument for that matter), whereas a guitar tuner will only recognize the six notes the guitar is supposed to be tuned to. That won’t help if your guitar is really, REALLY out of tune. I recommend using something like the Korg CA-30, which has a built in mic, and some other options. I’m not a fan of the clip on tuners that are mounted on the headstock of the guitar. Interpreting the movement of the needle on the readout can be a little tricky, and I see students puzzling over this often. Ideally, the needle should rest in the center and stay there after you strike the string for a second, and start to move to the left as the string slows down. If it goes a little sharp for a half second and then settles down to center and stays there a bit, then it’s probably in tune. If it goes to the center position but then immediately goes a little below, it’s probably a little flat and should be adjusted up. There’s two ways to approach this. The first is yank on the string a little bit after this happens; that is, after it goes sharp, pull down on the string a little to make it go a tiny bit flat, and therefore in tune. If it goes down too much, or not at all, then the problem could be with the nut. Sometimes the string is catching on something in the nut slot, and you can fix this by putting a little bit of graphite powder in the nut slot. You can buy little tubes of this powder at a hardware store, and they’re good for lubricating saddles on electric Stratocaster style guitars. De-tune the string enough so you can lift it out of the nut slot, and blow a little bit of the powder in the guitar’s nut slot. Use a needle or some other thin metal piece to make sure the graphite goes in there, then put the string back in the slot and retune it. It should have better fine tuning response now. Try moving the tuner closer to the guitar, or even have it touch the body of the guitar. If you buy a really cheap tuner, you may have issues with this. Also, make sure the other strings aren’t still ringing when you play the string you’re trying to tune. Derrick Campbell is a guitar teacher at Music Maker Studios in Brighton, MA, and also teaches at Noble and Greenough in Dedham, as well as the Boston Center for Adult Education. Derrick also performs a few times a week with his band Element 78 at weddings, parties, and night clubs.